7/19/11 – We were all tired and slept in a little this morning. Walker was fighting a cold so he slept in a little more. We drove into Cincinatti and almost missed the the huge Main Library. Fortunately, Nick noticed a striking sculpture/waterfall in front made of ceramic books. 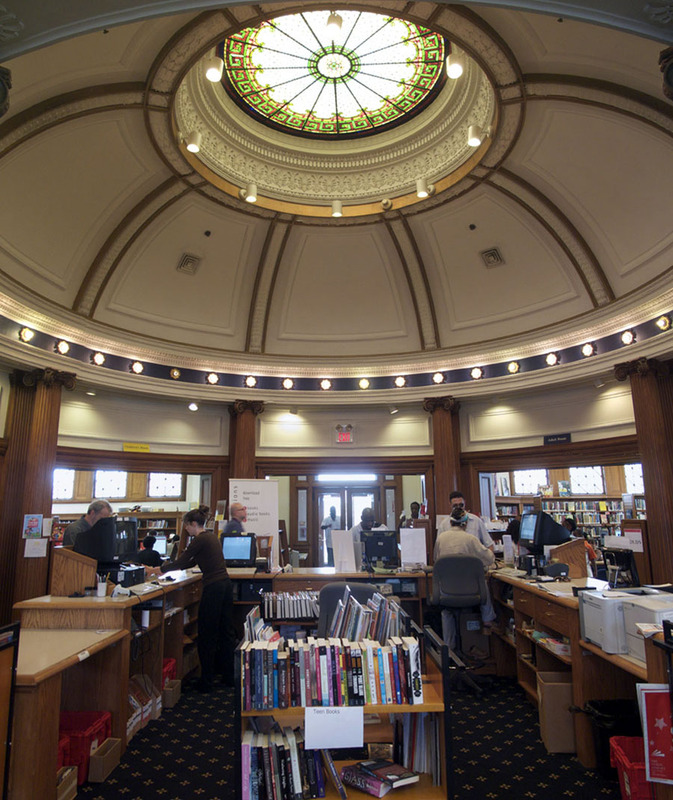 Ohio is known for having one of the best library systems in the country. 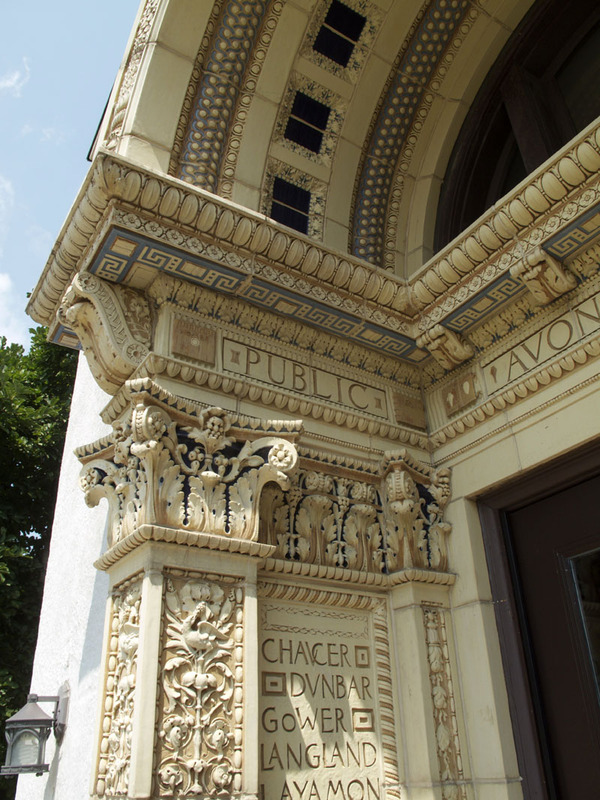 I photographed four out of the six Carnegie libraries in town. At the Avondale branch an older African American woman explained that this library has only six computers for a large neighborhood. When the children come in after school the adults have to leave. I promised that I would write about this on my blog. We drive west and north to the western Ohio farm country. I find it extraordinarily beautiful but Walker and Nick seemed overwhelmed with the heat and exhaustion. They find the tidy farming communities boring after the edgy places we have been. 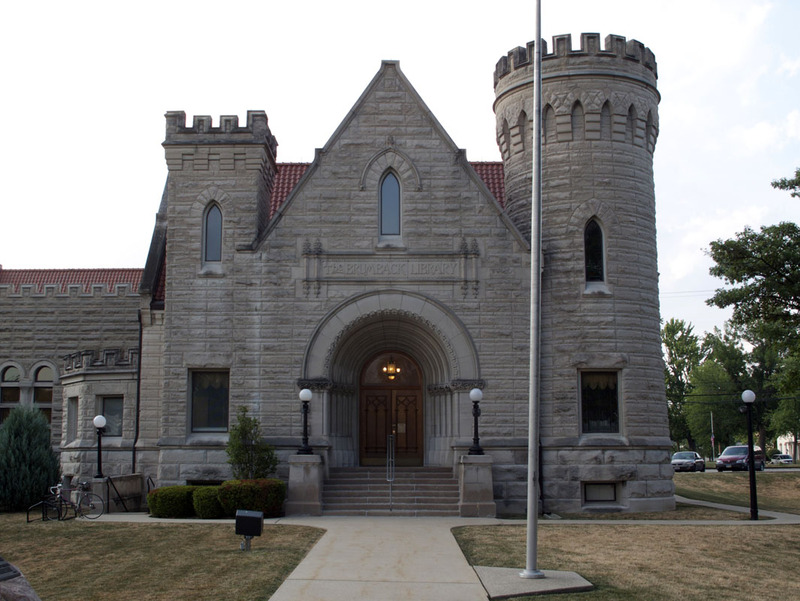 The Brumbach library in Van Wert is striking because it is built like a castle with a turret. 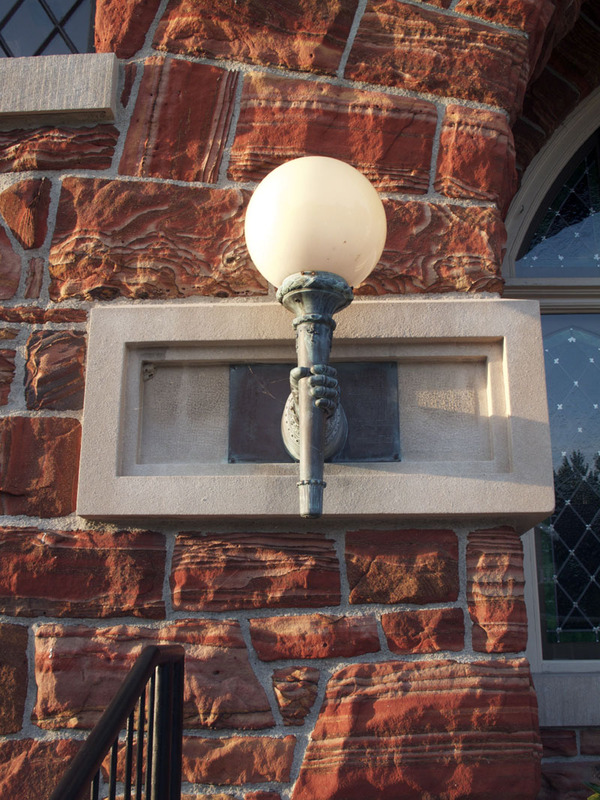 The library in Defiance is made of beautiful red rock and had some wonderful details. 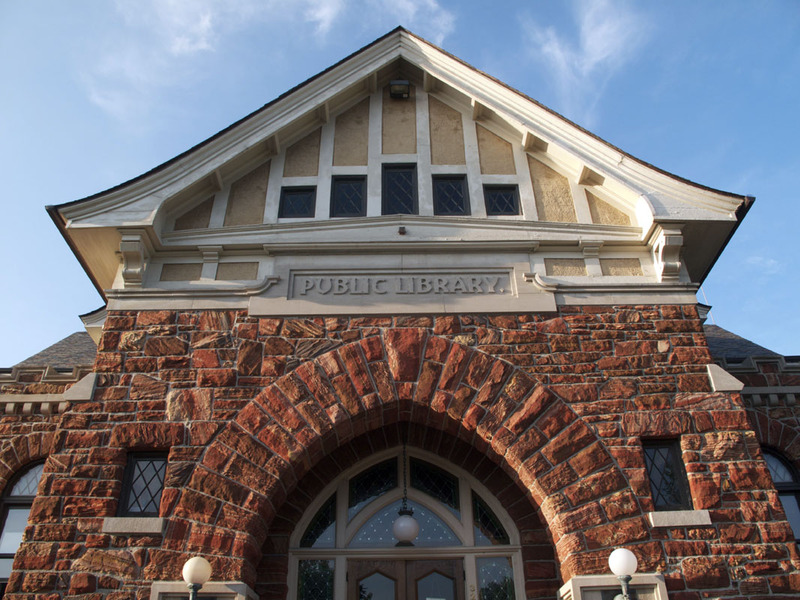 Finally the library in Wauson looks like a New England library with dormer windows on the roof. As I finish photographing the last light, the town was finishing its hot rod competition the next street over. We drove on into the late dusk light until we reach Toledo. 7/20/11 – Groggy from our long drives and lack of sleep we shook ourselves awake in our Days (daze) Inn. We decided to film a day in the life of the project today. As we were carrying our huge load of equipment, luggage and film down the extraordinarily long hallway of this fleabag motel we come upon a man completely passed out on the floor of the hallway. Nick film us as we have to step over him on our way to our car. I have a wonderful time photographing in the fantastic Main Library in Toledo. The library seemed very well organized and the Marketing Manager Susan Gibney had sent around a link to my web site to all the staff. As a result everyone knew all about me and the project and were very helpful. 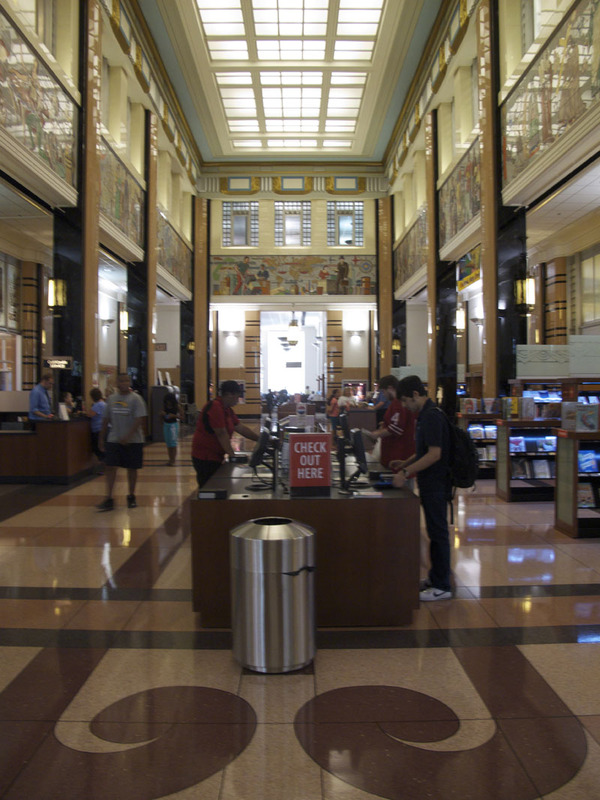 The interior lobby is one of the best examples of deco-era art and architecture I have seen in any library. It was also a New Deal project. There were so many fascinating parts to this library that I had to ration my time. That didn’t stop me from photographing an entire auditorium of squirming little kids watching “Getting Silly With Captain Willie”. It is utter chaos and I have great hope for this image. It was an hour drive to Dearborn, MI. Nick and Walker decided to interview me as I drive into Michigan. It is a good chance to capture my history of the project and to recap this trip so far. I briefly photographed the Henry Ford Centennial Library in Dearborn. For the first time I began to experience mechanical problems with my Mamiya 7 camera. I think it is because of the unrelenting heat. It has been really hard on us but it can fry electrical systems in cameras. Finally, we arrived in Detroit, a city whose economy has collapsed for large parts of the population. I photographed the extraordinary mural and entrance of the Main Library. I will do the interior tomorrow but I walked through the inside to scout out locations. It was rich! We escaped across the border into Windsor, Canada. 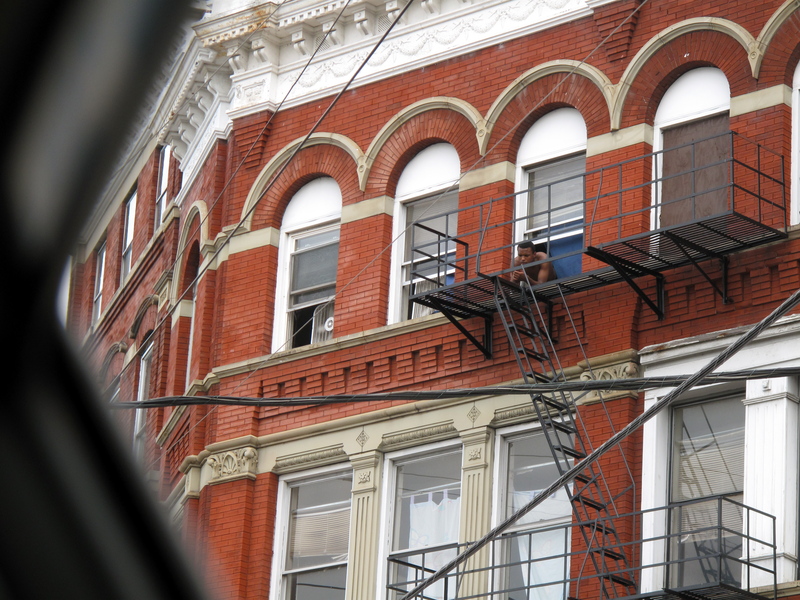 We stayed in a hostel at the University of Windsor which was cheaper and safer than staying in Detroit.